"Our guarantee is your total satisfaction. Let us exceed your expectations." We invite you to try our custom sandblast services. Give us a call to discuss your needs. Welcome to family and individuals considering a memorial. Give us a call to find a Spruce Mountain Memorialist in your region. 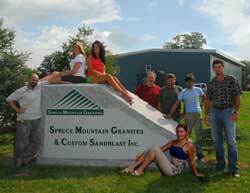 Spruce Mountain Granites creates memorials for every need in America. If you are a retail memorialist contact us for our world class array of choices. Try our Custom Sandblast Service. We provide every style of sandblast and provide every type of granite. Our modern Barre facility provides fast service, complete with our in house design team! 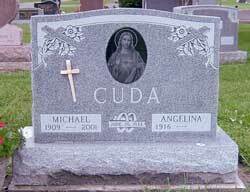 If you or your family are considering a memorial please call us for the name of a Spruce Mountain Granites memorialist in your area that can offer their services and review the unlimited options available, from mausoleums to markers and every style and color of granite from all over the world.